San Francisco’s Presidio, a 1,500-acre former military base, serves as a woodsy urban sanctuary, a must-do for military buffs, and an actual neighborhood for a few lucky San Franciscans. But with the recent opening of its first hotel, the Inn at the Presidio, this under-the-radar gem can also become the home away from home for visitors to the City by the Bay. Officially opened on April 1, the inn features 17 suites and five guestrooms in a beautifully restored historic building, ranging from $195 (just three rooms offered at this rate) to $350, with most featuring soaring ceilings, a fireplace, and spacious bathrooms. Rates also include a free wine and cheese reception every evening, a continental breakfast, and Internet. The Inn, which is aiming for LEED Gold certification, is located in Pershing Hall, a three-story building on the National Register of Historic Places that dates back to 1903 and once served as bachelor officers' quarters. 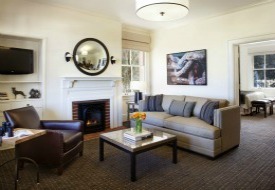 Rocking chairs on the front porch and a fire pit in the back evoke the property’s relaxed vibe, while inside, a polished military theme and Presidio memorabilia anchor the handsome decor, from a bugle collection in the lobby to thoughtful in-room touches like a burlap sack for the hairdryer. Discount packages for nearby attractions are in the works, including the Presidio Golf Course, the Walt Disney Family Museum, and SenSpa, an oasis of serenity located in a former Army barracks building. Guests can make an afternoon out of exploring the nearby Marina neighborhood and the waterfront along Crissy Field, with their spectacular backdrop of the Golden Gate Bridge, which turns 75 this May. In addition, the inn is nestled within the forested environs of the Presidio and its 24 miles of hiking and biking running trails (though some are undergoing renovations). Blending seamlessly into the woodsy surroundings are two pieces by U.K.-born artist Andy Goldsworthy: Spire, a sculpture of 35 cypress tree trunks fastened together that reaches 90 feet into the sky, and Wood Line, a serpentine stretch of trees that were removed from the Presidio and now line a trail. An ideal way to explore the Presidio is via its free shuttle system, called PresidiGo, which has a stop about a 10-minute walk from the inn. The bus stops at nearly 40 locations throughout the Presidio, but one highly recommended stop is the San Francisco National Cemetery. With breathtaking views of the bay in the background, this serene spot offers a peaceful resting place for nearly 30,000 U.S. military service members and other notable figures. Though its location in the Presidio promises a respite from the city’s hustle and bustle, Inn guests can easily (and affordably) reach other San Francisco neighborhoods by connecting to local transit via PresidiGo. It also offers an express shuttle that stops at three destinations in the city (free for visitors except during afternoon rush hour). A few things to keep in mind for booking: Only a few rooms remain on weekends for the remainder of 2012 (weekdays have much higher availability), and the front desk can be quite busy with calls. The inn only has one elevator, which goes only to the first floor, though staff are happy to assist with luggage. And several nearby street construction projects can make driving around the Presidio a bit tricky, so using public transportation is advisable. Finally, on San Francisco’s famously foggy days, the Golden Gate Bridge’s foghorn can be heard in the inn, especially in rooms along the building’s front facade. So light sleepers should remember to pack their earplugs. To get started planning your next trip, check out our San Francisco destination guide.